The dark ivy clad walls, tree canaopy and yew hedges give a sombre cloister like feel to this garden. 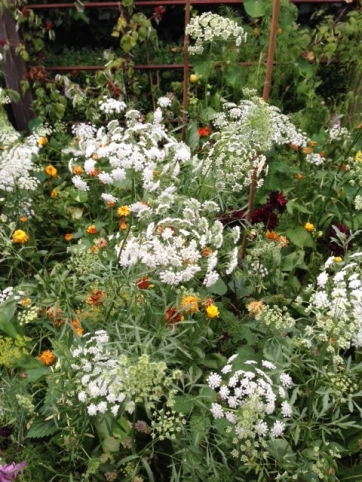 To introduce a light and airy quality I planted annual cutting garden flowers in one of the vegetable patches, instantly bringing a soft, ethereal feel to the space. 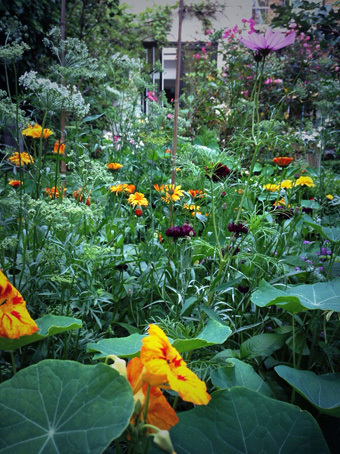 The seeds were from Benjamen Raynard's Higgeldy garden and were sown quite randomly, straight into the ground. Such relaxed method of sowing is not a particularly economical way to produce a cutting garden, and it might have been better to sow into seed trays and then plant the seedlings out as soon as the weather was suitable and the plants were strong enough. But my method has resulted in a delightful chaotic tangle, with nigella, three colours of cosmos, candytuft, marigolds and ammi majus all living happily togther. 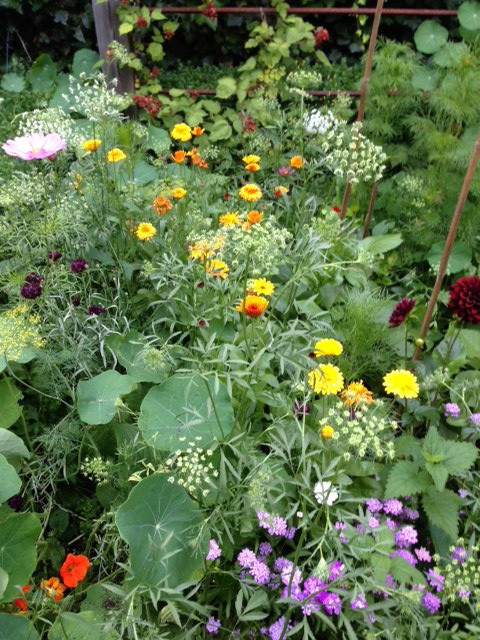 The bed is bordered by short box hedges which have three scarlet, orange and striped nasturtiums winding their way along them. The effect is relaxed, informal and full of surprises. I genuinely do not know what will appear where each morning. In the middle of the bed are three large dahlias in shades of bronze, deep claret and cream. Somehow everythig is surviing and even thriving. Perhaps I have just been lucky, it could easily have all gone wrong. Instead, I have a garden that is both wild and chaotic, tender and really quite magical.